Third Cybèle F-34 was the 1969 World 5.5 meter champion. In the photos of this boat, there is one from the World 5.5 Championhsip 1969 sailed in Sandhamn (photo is from Gordon Ingate who was there). The photo tells also that this is not F-38 the second Cybèle. F-38 have different bow and counter. Also there is no remarkable ‘chine’ visible like F-38 has. 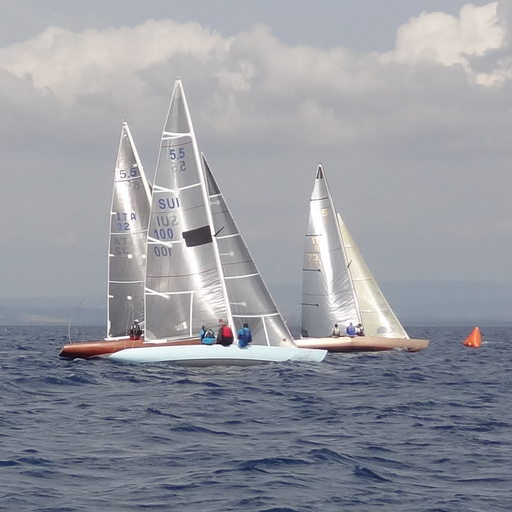 There are two F-34, a & b. Cybèle first and third and third is the world champion. The first Cybèle was a Britton Chance Jr. design #27a from year 1965. In Chance 5.5 list is only one Cybèle. Maybe Jean E. Le Guillou (father of Jean-Marie) modified the design 27a and had Cybèle third built by Egger for 1969 World Championship. “Cybèle is new this year (1969), to build a new 5.5 this year is quite fantastic. The boat is designed by Britton Chance Jr. ...” In the same article is two photos of F-34. In the photo of the fleet Cybèle is leading the reaching leg with number 34 in the spinnaker. Text to the photo is:”The world champion boat, French Cybèle, is designed by Britton Chance Jr. 1969 and is owned by J. E. Guillou. (Jean Guillou, the father of Jean-Marie and Nicolas). The nearest boats behind are American Nemesis, Swedish Tomatoe and Carioca II. 4th S-40 Wasa III, Sune Carlsson, Olle »Bull» Karlson, Börje Larsson (4-7-2-8-2-6-2) 41.7 pts. The next following years Jean-Marie was involved in the French America’s Cup Challenge. 1972 he sails in Kiel Olympic yachting and is fourth in the Dragons. Jean-Marie is born 1941. Le Guillou family had several 5.5s. The first, early sixties, was Ardilla F-18 an Ohlson design. Then 1965 WC and 66 WC Jean-Marie sailed Lord Jim F-28 and was 12th and 17th. This was not all. Le Guillou story continues. 1970 Jean-Marie and his brothers win also the European Championship! What a great story of the family Le Guillou.